Six albums with the White Stripes and two with the Raconteurs doesn’t seem to make Jack White a tired man. 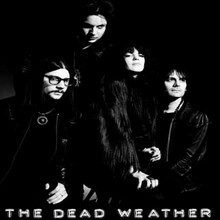 Sea of Cowards is the second installment of bluesy-rock excellence within a year from his latest band, The Dead Weather. A dimly lit stage drenched in blue light and smoke created the backdrop for the band on Thursday as Jack White and cohorts Alison Mossart (Kills vocalist), bassist Jack Lawrence (also bassist of The Raconteurs), and guitarist/keyboardist Dean Fertita (Queens of the Stone Age guitarist) took the stage. Later in the show, White also announces she’s ovulating which might have raised her angst factor. As the band dives into the powerhouse “Hustle and Cuss” and “I’m Mad” her highly sexually grinding whales became a little demonic. It wasn’t until the last half of the show that the mighty Jack White came to center stage, ripping into his guitar and playing keyboard with Fertita. White and Mossart possessed an indefinably palpable energy as they shared the mic during “Will there be Enough Water?” sending the floor spectators into a cascade of stomping and jumping on the closing “Treat Me Like Your Mother.” The band thanked the audience for coming to a live rock show verse sitting at one’s computer in a non-existent world. If all rock shows were this freaking good no one would be sitting in front of a computer.